We hosted our first Seattle dinner party! And, it was wonderfully fabulous. Christa and I found inspiration for our dinner in the June issue of Real Simple in a spread featuring dinner party menus that used grilling as the main cooking technique. This made me super excited because this summer we got a brand new, shiny blue Weber grill from my parents that we are always ready to use (thank you, mom and dad!). We decided to borrow dishes from the veggie and surf menus in Real Simple to create our own tasty and fun summer meal. To start, we grilled a few pitas and a block of feta cheese seasoned with sundried tomatoes, basil, and garlic. I found the cheese at our farmers market and it's from Mt Townsend Creamery. We drizzled the feta with olive oil and wrapped it loosely in foil. After about 20 minutes of grilling, the cheese was creamy and delicious served with charred pita pieces. We wanted the main dish to be inspired by our new northwest home, so we chose to grill wild caught salmon from Loki Fish Company, a company that also sells at our weekly farmers market. The color of the fish was enough to stop you in your tracks, but the taste was perfectly unforgettable. I've really never had salmon that tasted quite like it...is was oh SO good. Heat charcoal in the grill. In a medium bowl, toss 1 fennel bulb (very thinly sliced) with 1 lemon (also very thinly sliced) with 1 tablespoon olive oil. Place the salmon directly on the grill, skin side down, and season with 1½ teaspoons kosher salt and ½ teaspoon pepper, and top with the sliced lemon and fennel mixture. Cover the grill and cook until the fish is cooked through, about 30 minutes. 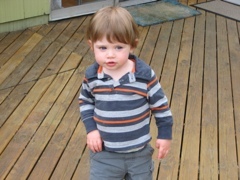 Jack loved being near the grill and is fixated on pointing at it and saying "hot!". However, I'm pretty sure he doesn't know what this hot concept means since he threatens to go to close every time! 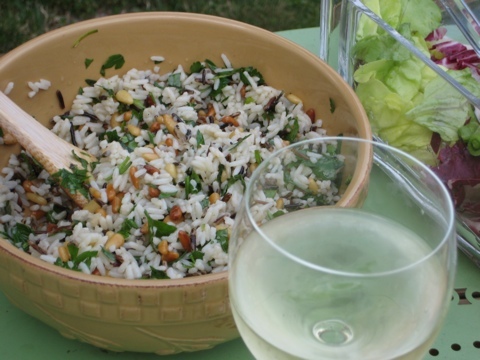 Christa brought a wild rice and pine nut salad and a green salad with radishes and snow peas. Both were delicious and refreshing served next to the warm dishes. We served the food with a local dry riesling which paired perfectly. It was an amazing dinner shared with wonderful friends. I just love a good dinner party, don't you? Cheers!